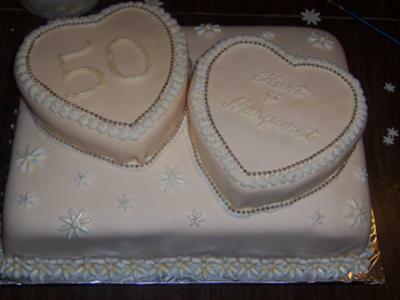 This golden wedding anniversary cake was 2 layers of golden lemon and filled with vanilla buttercream icing. The 2 hearts on top were only one layer. The cake was iced with vanilla buttercream and topped with light peach marshmallow fondant. The flowers are just white fondant with edible gold pearl dust painted on. The rest of the decorating was just with the same vanilla buttercream, except the gold beads of course! It is very pretty! You did a nice job on it!!!!!! And I love the little beads.... we can't get those where I live. YOUR CAKE TURNED OUT VERY BEAUTIFUL. WHAT A GOOD IDEA FOR A CAKE. I WILL FILE THAT ONE AWAY TO DO ONE DAY.